In the decade that followed grant of statehood to Uttarakhand in 2000, the state's development priorities changed. Infrastructure and real estate development, triggered by the cash flow from tourism, have led to indiscriminate mining of river beds for construction material, altering the fragile Himalayan environment. This human activity has exacerbated the effects of the flash floods that have badly affected the state. The number of tourists visiting Uttarakhand since 2000 has increased by 155 per cent, according to data with the Uttarakhand tourism department. The annual number of tourists visiting the state now is 28 million; the state's population is half this number. While the Association of Hotels and Restaurants of Uttarakhand, a private body of hospitality entrepreneurs, estimate that over 100 small hotels, mostly on the banks of rivers, have been swept away in the recent floods, accommodation for tourists remains a concern. A working paper of the Indian Council for Research on International Economic Relations published in 2008 on the economy of the state in 2006 illustrates this shortage. A survey conducted by the authors of the paper on development strategy for the hill districts of Uttarakhand stated that annually the state has only 8.4 tourist rent houses per million tourists, 102.5 hotels and guest houses per million tourists, and 337 beds available for every million tourists. The shortage of dwelling units to meet the ever-increasing numbers of tourists visiting the state led to the mushrooming of illegal structures, some of which were constructed right on the river banks at the risk of being swept away by seasonal flash floods. A public interest litigation filed in the Uttarakhand High Court by Roorkee resident, Dinesh Bhardwaj, shows there was scant regard for a notification passed by the state government in 2000, prohibiting any construction within 200 metre of a riverbank. Bhardwaj could not provide a count of the number of structures in his petition, but in February 2013 the bench comprising of chief justice Barin Ghose and justice Alok Singh ordered the state government to demolish all structures along the banks of rivers. 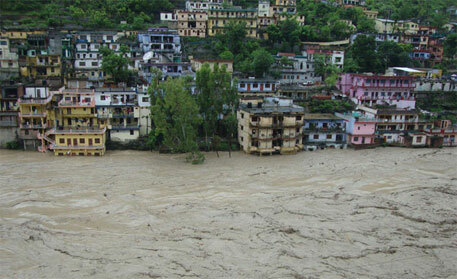 Several structures were identified along the banks of the rivers Ganga, Song, Bhagirathi, Alaknanda and Mandakini. No action was taken; only notices were issued, says a disgruntled Bhardwaj. “Had the state government taken an action against these illegal encroachments, people dealing with these structures would not have to face such a loss,” he adds. Experts say the main indicator of the thriving real estate business in Uttarakhand is the way river beds are mined for boulders, pebbles, sand and gravel. On June 13, 2011, Swami Nigamanand who had been fasting for 68 days in protest against the indiscriminate and illegal mining https://www.downtoearth.org.in/content/swami-and-sand-mafia on the Ganga river bed by a local quarrying and sand mining company, died. Subsequently, former Union environment minister Jairam Ramesh wrote to the then chief minister, Ramesh Pokhriyal, to end indiscriminate mining of the river bed. Data accessed from the state forest department show that from 2000 till 2010, 3,903.24 hectares (ha) of forestland in the state have been diverted for different mining projects. In 2011 the state formulated a new policy on mining. It proposed auctioning of various sites identified by the mining department. Forest officials at the meeting said that the state government would be able to realise a profit of Rs 300 -350 crore if these sites could be auctioned and favoured the passage of the new policy. Tenders were floated for mining sites at the end of 2012, which proposed an additional diversion of 1,608 ha of land for mining across all the districts (see table). The policy states that the first right of quarrying up to 5 ha of land would rest with the owner. Incidentally, most of the mining happens on river banks or on unmeasured land known as be naap zameen, which used to be under the gram panchayats. Until last year, about 400,000 hectare of be naap zameen was under forest department. However, with the new mining policy in place, these land parcels were transferred to the revenue department. Locals opposing mining fear that the state might divert these land parcels for commercial purposes. Mining department officials, however, have been arguing that the transfer was undertaken to prevent indiscriminate and illegal mining. But officials of the state mining department fail to explain why mining was stopped at Tailihat village of Garur Block in Bageshwar district of the Kumaon region weeks ahead of last year's elections, only to be resumed after a few weeks, when the election results were declared. As Tailihat's case was documented by Charkha Trust, a non-profit working with youth in the region, it turns out most of local youth were involved in the illegal mining on the Gomati river bed. This caused deep resentment among residents who were struggling to continue their farming activities amidst hundreds of trucks and dumpers taking out sand from pits 25 feet deep. A 40 kilogram of sand bag was sold for Rs 20 in the area. Professor R Shankar of IIT-Roorkee's environment engineering and planning division warns that unscientific mining of sand, boulders and gravel from the river bed will cause more devastation if it is not checked. “Himalayan rivers carry not only silt but large boulders and pebbles. Sometimes during the monsoon the river spills over or spreads because of the presence of large amounts of silt. Therefore, it (the silt) needs to be removed. However, one needs to understand the course of each and every river to its specifics; only then can such an activity be undertaken,” adds Shankar. It was a kind of encroachment drive which Nature undertook to clear the mess which was created by the corrupt.More than 100 hotels (illegal) washed away.In better terms they were cleared by Nature in a massive encroachment drive.It would not have never been possible for the state to remove these illegal constructions, as the state itself was a party.The sad part of the story is that the collateral damage is humongous and many innocent lives were lost.